From June 1988: Before they had claws... they had teeth! 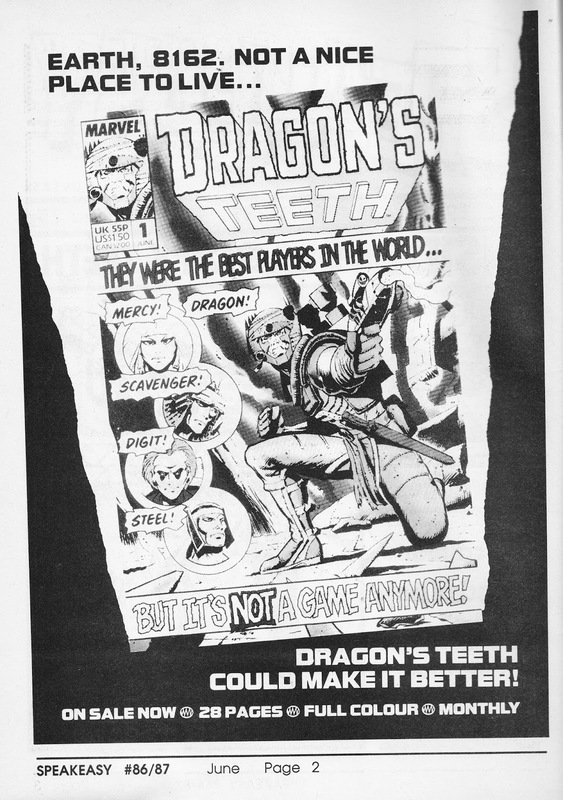 A rare MARVEL UK advert, published in the UK fanzine SPEAKEASY, for the about-to-launch DRAGON'S CLAWS title in the (almost) US format. 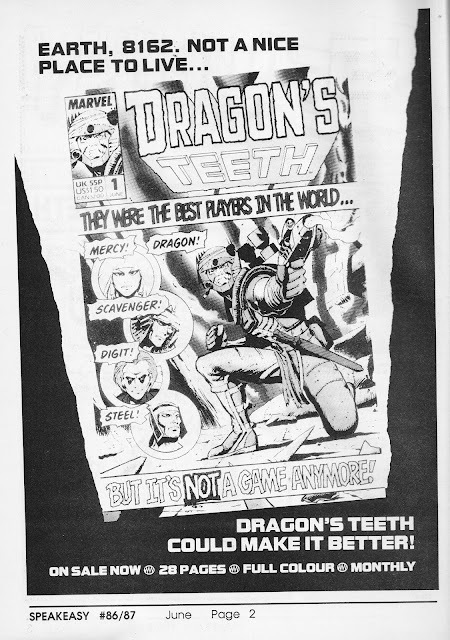 DRAGON'S TEETH was the original title, used in all the pre-publicity (including an article in this very same issue), until the lawyers stepped in and claimed a small (?) US publisher had prior claim. Cue a bit of frantic rebadging (which apparently only delayed publication by a week) and the new title. DRAGON'S CLAWS ultimately enjoyed a ten issue run before vaguely wrapping with no official notice that the book was closing. was anyone left looking for the never-to-arrive 11th issue because they hadn't read the runes correctly? As far as I know, the characters have remained in Marvel limbo ever since. Unlike DEATH'S HEAD (kinda) and THE KNIGHTS OF PENDRAGON (ditto), they weren't included in the 1992 UKverse reboot. The complete run was - however - reprinted in trade form by Panini. Yay. as rare as hen's teeth. or dragon's teeth if you prefer. I've got a full set of them. I lettered for it, and well-remember the last minute change in name. Strange thing is, I remember very little about the actual storylines, so I'll have to dig the comics out of a box in my attic and read them again.